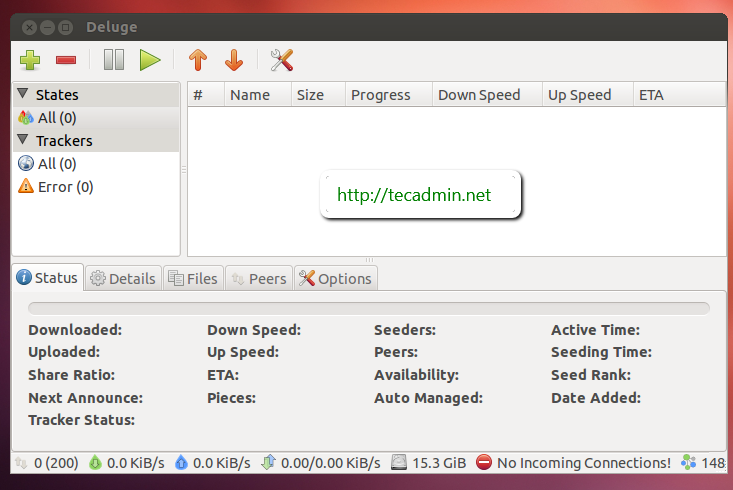 Deluge is a full-featured ​Free ​BitTorrent client Software for Linux, OS X, Unix and Windows. It is licensed under the ​GNU General Public License. It uses ​libtorrent in its backend and features multiple user-interfaces including: GTK+, web and console. This how to guide will help you to install Deluge BitTorrent in Ubuntu systems. There are number of features available in Deluge BitTorrent client, Few of them are listed below. Deluge is already available in ubuntu official Ubuntu repositories. To install latest published on Deluge PPAs using the following commands. We can use GUI option to start Deluge or use following command to start.